Hang the "Kitchen Sink" from the ceiling with one or more of our optional matching "Extenders". We highly recommend an optional "Extender" because it will prevent your bird from reaching the ceiling or climbing to unreachable heights. See Extender Ceiling Guards. 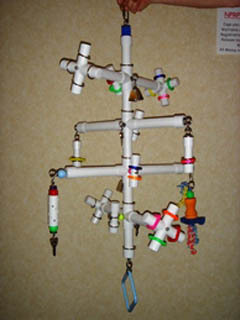 "Kitchen Sink" for Large Birds has perches that are suitable for Macaws and large Cockatoos and similar-sized birds. Today I received 2 Kitchen Sinks and eagerly opened the carefully packaged delivery. When I saw all the pieces I thought assembly would be challenging; however, they were so simple to assemble, each taking about 5 minutes! All the twirling toys and jangling are so much fun, I was reluctant to share them with my parrots. I'm thrilled with the quality and thoughtful design of these play gyms, and believe they are superior to manzanita gyms with the ingeniously textured PVC that provides perching security! I hung the gyms with self-drilling toggle bolts saving the trouble of locating a stud where I wanted to hang the gyms.